This versatile palette is a veritable treasure trove packed with new and limited-edition products and shades along with such Tarte bestsellers as a full-size of Park Avenue Princess Mineral Powder Bronzer. As an added bonus, this festive jewelry box comes with its own “off the chain” gilded trinket, guaranteed to be your go-to accessory for holiday parties and year-round. Includes: 16 x 0.06 oz full-sized shimmering eye shadow, 16 x 0.06 oz full-sized matte eyeshadow, 8 x 0.03 oz lip gloss, 0.21 oz Mineral Powder Bronzer, 0.25 oz highlighting powder in soft pink, 5 x 0.02 oz long-wearing eyeliners. Check out more sets & photos! This limited edition holiday palette in tarte’s signature color is stacked with 16 exclusive shades of eyeshadows and deluxe sizes of our best selling products making this the ultimate gift to give and to receive! I love the Gold as Gloss lippies!!! I wonder how small they’ll be? ‘Good as Gold’..Damn! Love that…! I purchased one of the Tarte Holiday big set 2 or 3 years ago and returned it as I found out it was made in China and the quality was extremely bad. You get what you pay for is right. You hate me because I don’t like something because of low quality???!! I think her point was that just because something is made in China doesn’t mean it is automatically low quality. That’s just a generalization. I’m not saying I disagree that some products made in China are of low quality, but certainly not all. I own this palette, and yes it is made in China, and yes, the quality is the same that one would expect from Tarte. Their eyeshadows are very soft and silky, and the value of this palette is just amazing. From experience most things made in china are low quality and cheap. When it come to makeup I stick with this that are from France, USA, Japen. God knows what the Chinese put in makeup. I feel sad that so many people believe such a ridiculous generalization like that. There is such a high demand for product made in China because it is so much cheaper- because of that some companies rush the manufacturing and compromise quality. Instead of writing off everything made in China (which will be 90% of what you own) research the COMPANY to find out what their values and standards are. China is not one giant factory- it has it’s own people and culture. I’m all for supporting companies who treat their employees well and take time to produce quality products- but just because something says “made in France” doesn’t mean it’s any better than something made in China. I think it’s a sad, pathetic stereotype about China and the Chinese that shows just how insensitive and closed minded people can be. stereotypes are stereotypes for a reason . The word stereotype means assuming sthng is true or is the case in general because of what is typical in most cases. So yes there it goes. Perception is perception for a reason… bcuz these things happen most og the times . Made in china stuff has often times issues like labourers being paid fair wages, quality control, standardization . I think twice thrice b4 i buy made in china makeup. I recently bought a 26 palette shadow blush from china thinking makeup is makeup and it will be fine ( against my bnetter judgement). The stuff is utter crap and i wretch every time i smell it .. its noxious smelling and smells of strong chemicals and is substandard. So here i give benfit fthe doubt and buy makeup made in china and yes it again fits the stereotype . American , european , even Indian made makeup hjas a minimum standard . Just because sthng is made in these dcountiers it doesnt become good quality but the fact is that these countries have set strict norms and regualtions which makeup companies have to comply with and bcuz of that 9 out of ten times the products by and large are superior .i am from india and cn produly say that even indian makeup like tips and toes and lakme may not have as much varitey but has a minimum standard and complies with all the rules imposed by the govt . at least i know its safe . Things made in China are often cheaper to buy than things made in France because of how they were produced. Cheap ‘made in China’ products could mean the workers were paid extremely low wages with terrible working conditions. If a company can get away with paying their employees significantly less by moving the factory to China, they’ll do it to increase their own profit. More expensive items (like luxury skincare made in France or leather bags made in Italy) are typically handmade by someone making a living off of their specialized skills. Chanel bags are a classic example. Many people buy fake versions that were made in China, and the people that made those bags may be struggling to survive on 25 cents a day. A real Chanel bag is handmade in France by a handful of skilled workers that are paid much more for their work. It’s not always about buying what’s cheapest. Paying more for quality can sometimes mean supporting businesses that treat their employees ethically. Obviously most of us can’t afford to stop buying ‘made in China’ entirely, but it’s something to think about. So true that we can’t always avoid buying products made in China. In fact most of products I buy seem to come from China nowadays. There is very little choice unless you are really rich. BUT I will never buy or use any makeup that’s made in China when there are so many other choices available at reasonable prices. Quality and safety control = $$ and I’m more than wiling to pay for it. I bought the treasure chest, I rather like it.. but I liked last year’s better. Rather have more blushes than the eyeliners. But their eyeshadows in the set are worth the price. When will these launch on Sephora, Christine? I’m dying to know! I purchased the Tarte holiday set last year and it was terrible! The quality was so bad that I could barely pick up any pigment. I think that I am probably done with Tarte forever. i hope in person the shadows look better than in that photo. That palette has some gorgeous shades in it! I thought I’d *finally* found a great palette of matte colors, something long missing since the 1990s. Well, both the matte and the shimmer colors (and the blush and highlighter that come with this set) have *very* light pigment. I tried piling it on. I tried it over primer. I tried piling it on over eyeshadow over another layer of primer and eyeshadow. They just look like mud. It went back to Sephora. So, someone *please* come out with a palette of good quality matte eyeshadows! I have last year’s Tarte Treasure Chest. The shimmer shadows are not very pigmented — using a color base helps — and the lip glosses are mostly sheer. The matte shadows are great though — except for the white one — and the blushes, bronzer and highlighter are good too, if you don’t mind a little shimmer. The biggest hurdle to me using it on a regular basis is the packaging which is bulky and fussy. This is basically the same packaging, so I’m skipping it. I got this years Jewelry Box as a birthday gift about a week ago. The colors are definitely not richly pigmented but they are beautiful and not chalky. They show up great when I dampen my brush just a little and use a base but otherwise the pigment is very sheer. Can’t compare it to any other tarte set but I like the emphasis on eyes in this set. I find that sets w lots of blushes dont have enough options for darker skin. But in this set I can use practically everything. If you already have all these colors from better quality brands then you should probably pass. Definitely not comparable to Nars or UD in terms of richness and pigment quality. But was I excited about it as a gift? Helllz yea! It’s beautiful and has great unwrap appeal. I think the pigmentation of the shadows in last year’s treasure chest was fine. If anything, they were all a little bit too pigmented. This year’s shadows are definitely less pigmented but still a high quality eyeshadow. I have used shadows from MAC and UD that aren’t as good as some of these shadows. 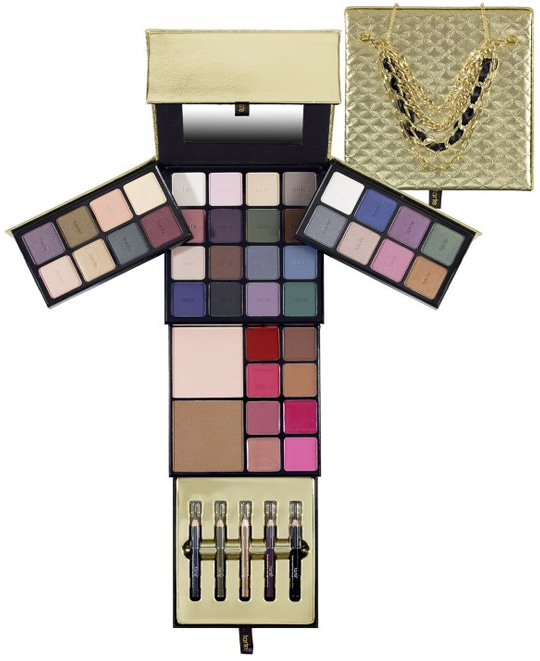 Some people will love this palette and others will hate it. But I think that everyone should at least check it out at Sephora. It is made in China but that’s only because labor is cheaper and the packaging is cheaper. The actual product is still regulated by tarte and the ingredients are listed. Jane, I have found generally that the quality of Lorac eyeshadows is much better than Tarte. I purchased the Lorac Box Office Sensation but I have not yet tried it so I can’t compare the two sets. 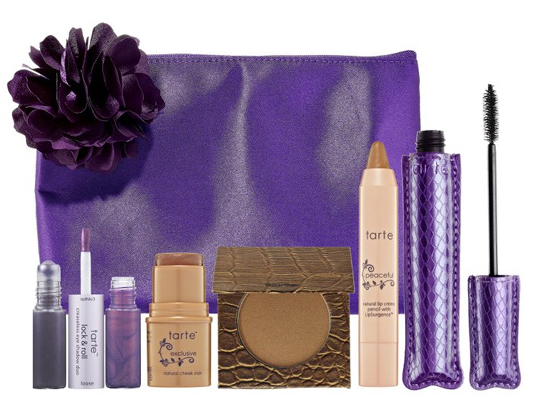 But given my experience with last years Tarte Holiday set I would try the Lorac set. I also have to strongly disagree with the comment that Tarte shadows are comparable or better than UD or MAC shadows, not even close. The eyeshadow palette looks kinda blegh; the colour selection isn’t interesting enough. Wish i could buy that as well with all holiday collections!!! I think Tarte is very “Juvenile” and the quality is Bad. They spend more money on packaging than on the actual products.. i had an eye shadow palette i believe it was the day to night palette and i returned it because i couldnt blend the shadows or they turned muddy. the jewelry box looks gorgeous! I was thrilled to find a big palette of matte e/s – until I tried it. They were pitifully un-pigmented. I returned it. I was so excited to get this, then when I go it from the mail and tried it I was very upset! the colours were awful, the blending was bad. It was one of my worst makeup purchases ever! dont waste your money.